Can Glycolic Acid Peels Treat Acne Scars? Acne is a common dermatological issue that we very much need to deal with. Some of us rely on homemade remedies to get rid of this condition while others go for acne care products readily available in the market. But the worst part of this skin infection is the scars that are left after the healing of the blemishes. It becomes really tough for us to fade away those marks and even out the skin again. However, many people believe that glycolic acid peels can treat acne scars efficiently. Let us try to find out the truth behind this fact. First of all, know how to differentiate acne scars from other wounds or marks. You might have a few pink or brown spots on your skin, which are caused by Post-Inflammatory Hyperpigmentation (PIH). It is nothing but certain type of skin discoloration that becomes lighter on its own. But acne scars are resulted from the damage of dermis, the middle layer of our skin. When dead cells, excessive sebum and bacteria start accumulating around the hair follicles present on our skin, the roots become clogged up. Gradually, it becomes difficult for these objects to move across the uppermost layer of the skin and they finally rupture it to reach the dermis. As a result, we get severe acne scars. 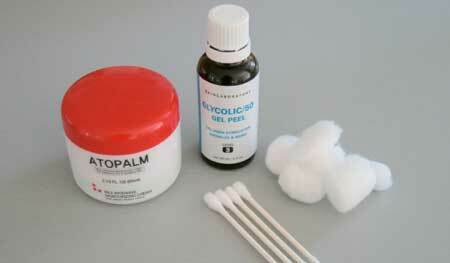 Before digging into the matter, it is also important to know what glycolic acid peel is. It is a chemical peel made of glycolic acid or hydrocyacetic acid, which is basically a water-soluble crystal of Alpha-Hydroxy Acids (AHA) family having no significant color or odor. This acid can separate skin cells from each other by releasing the glue-like bonding object. Hence, it can be used as a good exfoliant for peeling off the damaged, discolored and uneven superficial skin. Apart from revealing the fresher and brighter skin layer, glycolic acid also plays a key role in the replenishment of collagen as well as elastin which helps greatly in eliminating wrinkles, fine lines and all other flaws from the skin. From the above section, it is quite clear that glycolic acid is able to regenerate new layer of skin cells by discarding the old and damaged one. It is certainly beneficial for treating the scars caused by acne. It has been seen that glycolic acid peels can fade away mild to harsh acne scars when used along with sufficient amount of vitamin A as well as vitamin C. The concentration of the peel can vary depending upon the severity of the scars. However, you can apply 20%, 35%, 50% or 70% glycolic acid peel under the supervision of an expert. The application time can vary from 3 to 15 minutes and the treatment can be continued up to 24 weeks. However, there might be some side effects of this type of treatment. If you become unable to use the right concentration of the acid, you will end up exfoliating your skin too much which will result into acute skin inflammation and redness. So, make sure that you seek the help of a dermatologist before starting the treatment. He / she will guide you through the entire procedure as per the needs of your skin.